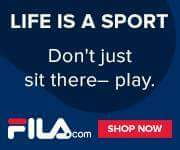 #FILA has an amazing collection of #footwear, #outerwear, pants, tops & #accessories. Guys right now are really digging the old school jackets and the #Cage sneakers. Shop the FILA® Store for the latest in Athletic performance and lifestyle apparel for Men, Women, and Kids. Shop here & save up to 60%!